NATICK, MA, November 7, 2012 — Genelec, the world’s longstanding pioneer in active monitoring, is proud to announce the latest news regarding its highly successful TEC Award-nominated SpeakerAngle app. First, in response to popular demand, the app is now available for Android devices (https://play.google.com/store/apps/details?id=com.genelec.apps&feature=nav_result#?t=W10), priced at just $ 0.99 USD. The Android version of SpeakerAngle is functionally and graphically identical to the popular iOS version released in August and already in use by thousands of audio professionals and home studio/theater owners. It works on all Android smartphones and tablets running OS 2.3 (Gingerbread) or later and equipped with a gyroscope chip, including the Samsung Galaxy II and III; the HTC Evo 3 and 4; the Google Nexus; and the Asus Transformer and Samsung Galaxy Tab. Second, Genelec has announced the availability of SpeakerAngle version 1.2 for iOS devices as a free update on the Apple iTunes Store (http://itunes.apple.com/us/app/speakerangle/id549033688?mt=8). This latest version offers improved functionality that indicates when speakers are angled at +/- 3 degrees of 30 (the range of angles that will generally work best when speakers are equidistant from the listening position). All iOS versions of SpeakerAngle are fully compatible with iOS 6 and with the iPhone 4 and later (including the new iPhone 5), iPad 2 and later and iPhone Touch 4th Generation and later. SpeakerAngle is the first digital tool that allows anyone to correctly set and match the angling ("toe-in") of both stereo and 7.1 surround sound speakers, helping to ensure optimum audio fidelity. Easy and intuitive to use, SpeakerAngle was co-developed by Genelec and AudioApps (a new mobile apps company founded by industry veteran Howard Massey). 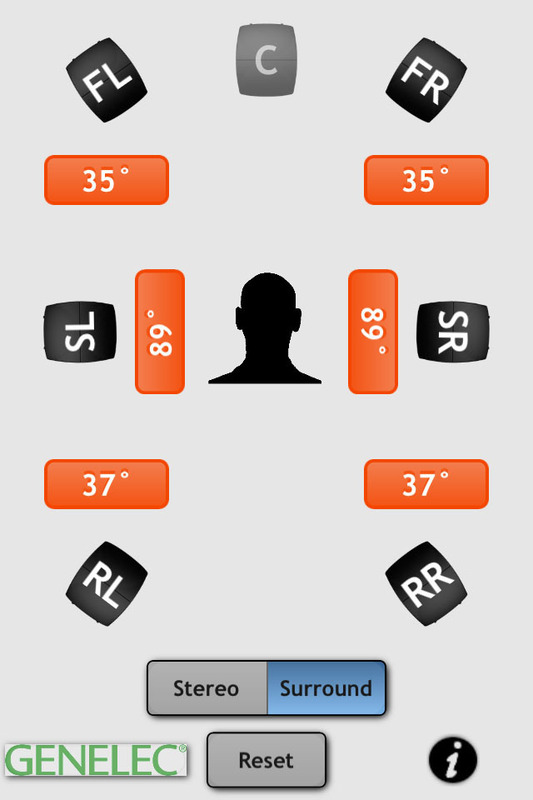 In the app, dedicated onscreen speaker icons move as the actual speaker is rotated, while number boxes below each speaker icon continuously display the angle of the speaker. The number boxes also change color to let users know when their speaker is angled within industry recommendations, and when it is angled to the same degree as the other one in the pair (i.e. left and right in stereo systems; front left / front right, rear left / rear right and side left / side right in 7.1 surround systems). Detailed information screens provide a tutorial on speaker angling, as well as step-by-step instructions for using SpeakerAngle. To use SpeakerAngle, simply select the desired mode of operation (Stereo or Surround), then place your Android or iOS device on top of the speaker you want to angle. Set the speaker so that it is facing straight towards you, then touch the corresponding speaker icon so that it lights up. Next, touch the icon's number box to let SpeakerAngle know that the selected speaker is currently at “zero-axis.” Now physically rotate the speaker inwards (that is, towards the listening position). 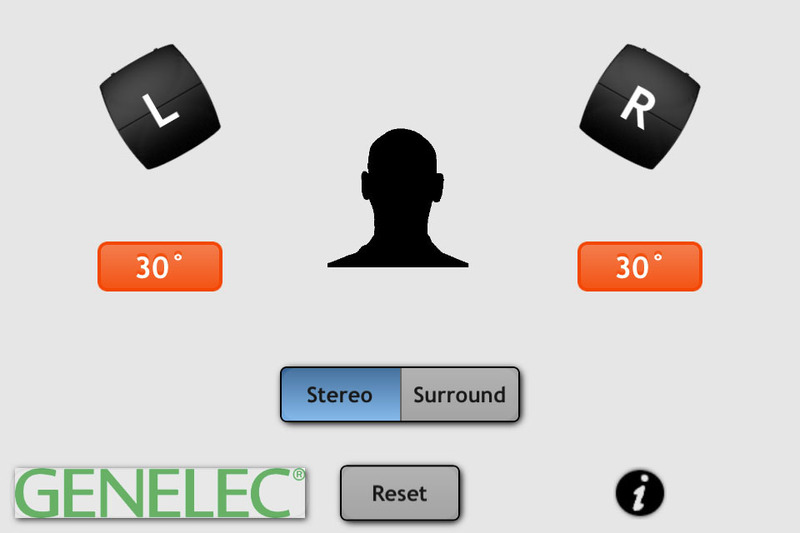 The selected speaker icon will move accordingly, and the number box below it will display the degree to which the speaker is angled. When the speaker is angled within the industry recommendation of 20 degrees to 45 degrees, the number box changes color, from red to green (light green when angled between 27 and 33 degrees). When you touch the speaker icon once again (or select any other speaker icon), the number box changes color to orange, and "freezes" the currently displayed angle. Next, touch the paired speaker icon (for example, the right speaker in a stereo system if you have just angled the left speaker). Pick up your Android or iOS device and place it on top of that speaker, then touch the number box below the speaker icon. Physically rotate the speaker inwards until the number box changes color to yellow, indicating that this speaker is now angled to the same degree as the first one. To continue experimenting with different speaker angles, you can start from scratch at any time by pressing SpeakerAngle's RESET button. Photo Caption 1: SpeakerAngle Screencap, stereo. Photo Caption 2: SpeakerAngle Screencap, 7.1 surround.